Add it to the List is a variation of In My Mailbox hosted by Kristi at The Story Siren. Basically, you share your bookish haul for the week. It finally came! The Fault In Our Stars by John Green. Signed of course, like all his preorders. He is such a stud for signing every single preorder. I can't even. I'm so lucky to have a husband who indulges my owl obsession. Look at that quirky fellow! Copy from my local library. YAY libraries! AND YAY for the library challenge. I'm reading this one for book club at work! I know, it's an adult book. BUT it's supposed to be like Memento on meth. Count me in. Received unsolicited ARC from Penguin Publishing. It's a Robin Hood retelling in YA form. YES PLEASE. Received ARC from April at Good Books and Good Wine. Thanks, April! Magical Middle Grade mystery set in a hotel. Sounds delightful! 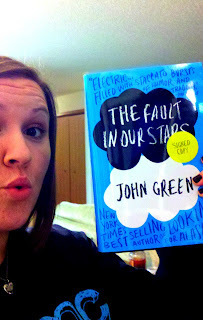 I love John Green and I'm dying to read his new book. Enjoy! So I hate to admit that I've never read anything by John Green *ducks head and hides in shame*. Should I start with TFiOS, or some of his earlier stuff? Also, Floors sounds fun, and I'll always read a Robin Hood retelling! Can't wait to see what you think about them! I haven't read TFIOS yet, so I'm not sure if it's a good place to start or not. They are equally funny and poignant and lovely, in my opinion! So jealous that you got your copy of TFIOS! Mine was supposed to come yesterday and didn't. :/ However, it gave me a chance to read Katherines, which was the only John Green book I hadn't read! Enjoy all of your books!! I'm so glad that Floors made it's way safely to you! YAY YAY YAY THE FAULT IN OUR STARS! Also? Robin Hood? YES PLEASE FOREVER AND EVER AMEN. Everyone is fangirling over John Green this week! I guess I need to pick up one of his books soon. Hope you enjoy all your books! YES. you most certainly do. I look forward to reading it! I'm going to try and give it a whirl tonight...before I go to sleep! BAHAHA! The lil' owl is sooo cute. 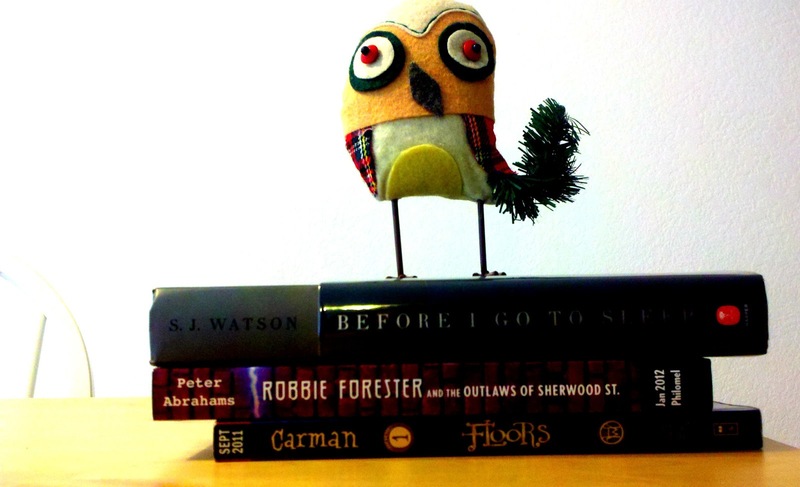 Robbie Forester and the Outlaws of Sherwood Street by Peter Abrahams sounds interesting. I love re-tellings they're so much fun. Enjoy your books. YAY Fault in Our Stars! My copy should be coming... soon. ;) My friend just got hers the other day and it had a yeti that John Green's wife drew so we were freaking out about that. ;) And that owl is adorbs! My sister also has an owl obsession. Signed copies feel much more special! And I love owls too, I need more of them all over my house! Robbie Forester and the Outlaws of Sherwood Street sounds interesting, I'm pretty sure I need to check that one out. Tempest and The Eternal One's Giveaway! I'm so curious about the john Green book I had no idea he was so popular!! Great haul! I hope you enjoy everything you got this week! Come check out my IMM! Great set! Seems like everyone got John Green's book. I want to read it. 1) I love adult if it isn't TOO boring. 2) I love Memento because I love Christopher Nolan, Guy Pearce, and Carrie-Ann Moss. I NEED TO KNOW. So share the deets as soon as you find out. I trust your judgment. Yay for The Fault In Our Stars! I'm dying to read that one! Robbie Forester and the Outlaws of Sherwood Street looks really interesting as well so I'll be curious to see what you have to say about it. Happy reading! yep, i think i need these.